Face it, some Facebook posts just get more likes, shares, and comments than others. But rather than simply accepting it, why not uncover the secret to receiving similar social love and use those insights to develop similar posts? Luckily, the secrets are out in a new infographic featuring findings from a research report by BuzzSumo. The report was created from an analysis of data from 800 million Facebook posts published during 2016. It revealed some stunning social surprises about the types of Facebook posts that consumers love and those that earn the most engagement. To see which Facebook posts win the hearts and shares of consumers, MarketingProfs shared the top insights from the infographic. While there are many social media networks, Facebook remains the favorite. According to the infographic, 79% of Americans online use Facebook. In fact, most people use Facebook more than other social media platform. When it comes to posting on Facebook, more isn’t always best. 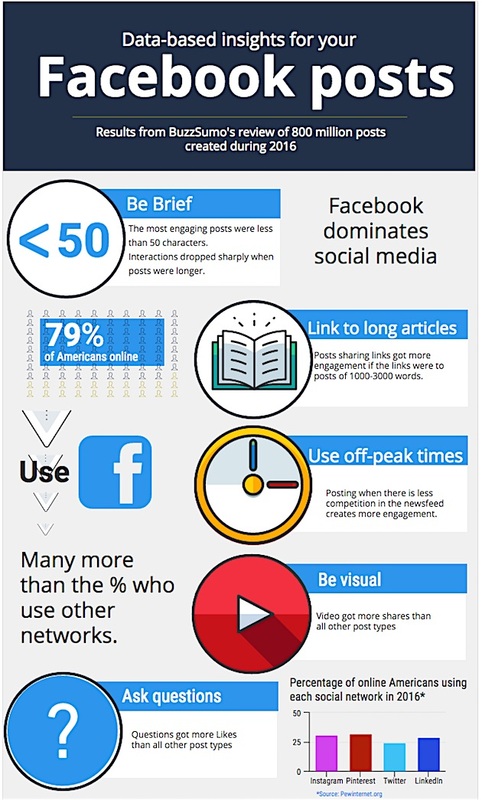 The infographic showed that the Facebook posts which generated the most engagement actually had fewer than 50 words. Additionally, Facebook posts that shared links earned much higher engagement when those links led to posts with only 1,000 to 3,000 words. Clearly, less is more when posting on Facebook. The competition for likes and looks is very high on the most popular social platform, but there are some savvy strategies to stand out from the crowd and get your posts noticed by consumers. The infographic revealed that the best time to post on Facebook is during off-hours when there is little competition in the news feed. This decreases the volume of posts, so your posts have a greater chance of being seen, read, and shared. 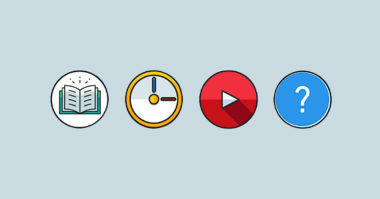 By posting on Facebook during off-peak hours, you’re on the right track for greater engagement. With so many posts vying to be seen and shared, how can you grab your readers’ attention and get your message shared? Video is the way to go. According to the infographic, videos were shared more often than other types of posts on Facebook. If you’d like to see more surprising findings from the infographic, click here. Learn how to earn more likes on Facebook. Contact MDG Advertising today at 561-338-7797 or visit mdgadvertising.com.